La temperatura dell'acqua è di circa 20 ° C nel mese di febbraio e di 28 ° C da luglio a ottobre, rende una esperienza di immersione piacevole e divertente. La visibilità è di solito 20-30 metri ti permette di guardare più lontano che in qualsiasi altra parte del mondo. Non è che avete bisogno di guardare lontano, come i nostri siti di immersione sono pieni di belle barriere coralline, relitti incredibili ed una fantastica e ricca fauna marina. C'è abbondante vita marina tropicale da vedere e fotografare, scogliere da esplorare, pareti profonde, relitti, e la possibilità di effettuare immersioni techniche piu impegnative. 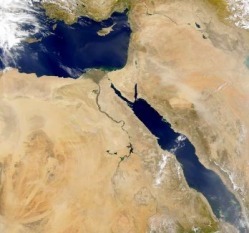 La barriera corallina a nord nella zona di Hurghada, sono due piccoli scogli e un altopiano che si estende da nord-ovest a sud-est. Solo nei giorni di calma si può raggiungere questo reef. Il lato nord si affaccia su una parete verticale fino a 80 mt, ottimo luogo per vedere grandi pesci pelagici e squali di barriera pinna bianca. I giardini su entrambi i lati della barriera corallina circa 16 - 22 mt offrono una vasta fauna marina incontaminata. The East of the island offers great wall dives, large fish can be seen in the open water and Gorgonian fans grow out from the wall . This site can have strong currents so don't stray too far from the wall. As you reach your permitted time at depth ascend over the top of the plateau and follow the reef back to the moorings. For dives on the plateau look out for Giant Morays, Napoleon fish, Blue spotted Rays, Crocodile fish and on the reef walls Scorpion fish and Stone fish. Sha'ab El Fanadir is a large reef east of El Gouna. On the east side of the reef lies a popular mooring point at El Fanadir, a fairly typical Red Sea reef dive, offering great visibility, a reasonable amount of corals, blue spotted rays, lionfish, stonefish and the rest of the usual suspects. There were a lot of other boats here, probably due to it being close to the shore relative to the other sites. As this reef was my first ever Red Sea dive, to me it was pretty fantastic! One of the most famous dive sites around Hurghada is Stone Beach which is also known as Hamda. It is located just off shore from Giftun Kebir with a beautiful white sandy beach and some spectacular cliffs above it. Under water is a small 15 meter deep plateau from where a steep wall drops down to 70 meters. The wall is full of the common reef fish, coral, stonefish, morays and octopus. Into the blue are reef sharks, barracudas, turtles, jacks and tuna which all wait for their meal of the day. Whale sharks have been reported in this area, but only in the right season. Is one of the most stunning dive sites near Hurghada. Also named the Aquarium, is a dive site full of marine life and great for photographers. At only an hour boat ride from Hurghada it is also one of the best accessible. Actually, it is amazing how this reef survives and continuous to live with these amount of divers visiting it. You will see different types of bannerfish, anthias, parrotfish, angelfish and butterflyfish. But also eagle rays, bigeyes, snappers, sweetlips and trevallies are quite common inhabitants. Don't forget the triggerfish who try to bite you especially in September when they are nesting. To the west side of the reef are two large coral towers which are beautiful decorated with soft corals and gorgonian fans. To the east are some smaller pinnacles which are swarmed by small fish. You will feel like swimming inside an aquarium and it is definitely one of the better sites so close to Hurghada. The other end (west) of the Fanous reef has two main ergs and several smaller pinnacles off its west end. You can follow the reef wall round and explore the reef face and coral gardens which is full of marauding jacks or if you feel energetic you can swim the 50m to the furthest erg which is well worth a visit, explore the remaining erg and pinnacles on the way back. Again watch out for dolphins at anytime during the dive as they are frequent visitors. The Excalibur was a beautiful twin mast motor and sail vessel, around 22m in length and originally finished in white and light blue, with dark blue framing. As far as I can tell she sank some time between November 1995 and February 1996. She now rests upright (with a slight lean towards her starboard side) in a small sand lagoon in 22 metres of water. Coral boulders surround the lagoon perimeter making for a surreal setting. The most northerly site for day boats out of Hurghada. A huge horseshoe shaped reef there has many dive sites on all sides. The north point is home to Mantas in season. The lagoon is dotted with ergs and is renowned for sightings of the resident dolphin community, divers have spent up to 30 minutes with dolphin pod here. Nearby is a little known site but well worth a visit. The whole area teems with life, unicorns, scorpion fish, groupers, morays, emperor angelfish, blue spotted rays and underneath the table corals look out for white tips resting in the sand. In the sandy channel between the main reef and the gotta you will find cone shells, and flatfish. 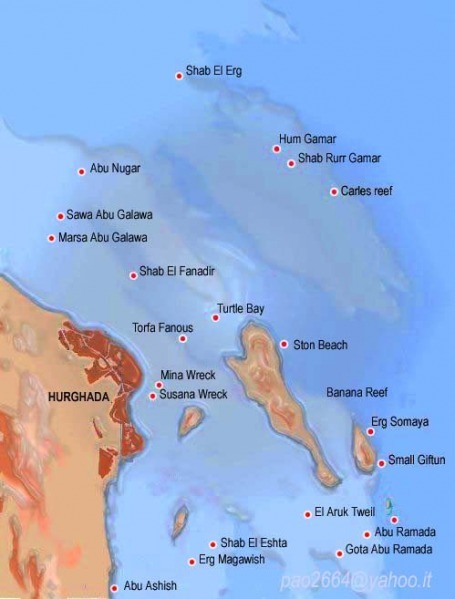 This "T" shaped reef has a shallow plateau to the west with numerous small ergs and two small sub reefs Gotta Abu Nigar and Shab Iris. Some parts of this reef system are positively dull while others are stunning. If you can dive the stem of the "T" on the north side you will find three small ergs and the diving there is almost virginal. You will find broom tail wrasse here as well as parrotfish and unicorn fish. Good diving on all sides surround this offshore island. The south end has a shallow plateau where the moorings are located this location is the most used. For first timers at Umm Gamar the dive will take place from the plateau, moving eastwards to the drop off then north along the wall. After a short swim against the current you reach three pinnacles close together, chimneys reach through the pinnacles toward the surface. After exploring this area you take advantage of the light current to drift back to the corner of the plateau where three small ergs are found, covered in glassfish. Finish the dive on the plateau exploring the numerous coral heads and reef fish. The plateau is home to Napoleons, Emperor Angels and free swimming Morays. The east and west side have awesome drift dives and the northern tip or "halg" has a magnificent coral garden but is only accessible in very good weather. Big groupers and lots of sweepers live in the multiple caves found along the eastern and western walls and drop offs of this tiny island's fringing reef. This narrow reef creates a huge calm lagoon, a great place to stop for lunch and catch the sun before the second dive of the day. The lagoon itself and the enclosing reef wall is relatively uninteresting and naturally lifeless but on the seaward side the area bursts with all manner of sea creatures. Swim through the gap between the first erg and the reef wall and head across the coral garden to the second erg, home to hordes of glassfish and the very occasional frogfish. Continue with the reef wall on your left to see the gorgonians on the corner of the reef where it turns west, if you have enough air continue along the north face where the corals are pristine, if not return with the reef on your right and explore the first erg before returning to the boat. Dolphins are often encountered anywhere around this reef so keep an eye out. Really two small islands surrounded by a single reef. Good drift dive along the steep eastern wall, with big fan corals, overhangs and swim throughs. Big groupers. fringing reef, which surrounds this cape, offers a good shallow dive on the hard coral garden found north of the lighthouse with schooling barracuda, napoleon fish and groupers. Garden eels. A shallow erg field lays on the south side of the island where lots of blue spotted stingrays, puffer fishes and morays are found swimming through a pinnacle landscape. A dramatic drift dive can be made along the eastern wall with the chance of big fish out in the blue.